It won’t come as a surprise to any of my readers that I was the Historian of my Boy Scout troop growing up. I am a person who obsesses over the details of dates, events, and experiences. In fact, for about 15 years now I’ve kept a daily journal. If you asked me what I did on November 6th of five, six, or ten years ago, I could look it up and tell you in detail. It’s that bad. Now, sometimes it’s handy to have such an addiction. It makes for some fun reminiscing. Before the digital camera age – and even for awhile after it started – I was having 3″ x 5″ photo prints made up at Walmart for every picture I ever took. The other day I pulled out one of three huge boxes that are chock full of car pics. That’s right, just car pictures. 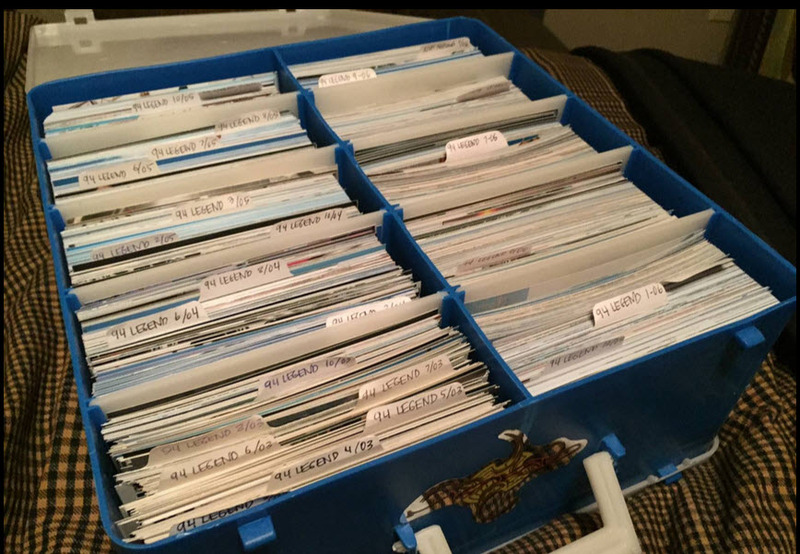 They’re organized by month & year, of course, making it easy to “pick a date – any date” and see what my automotive interests were like at the time. I can get sidetracked for hours thumbing through pics. This week, my time travels took me back to 2003. 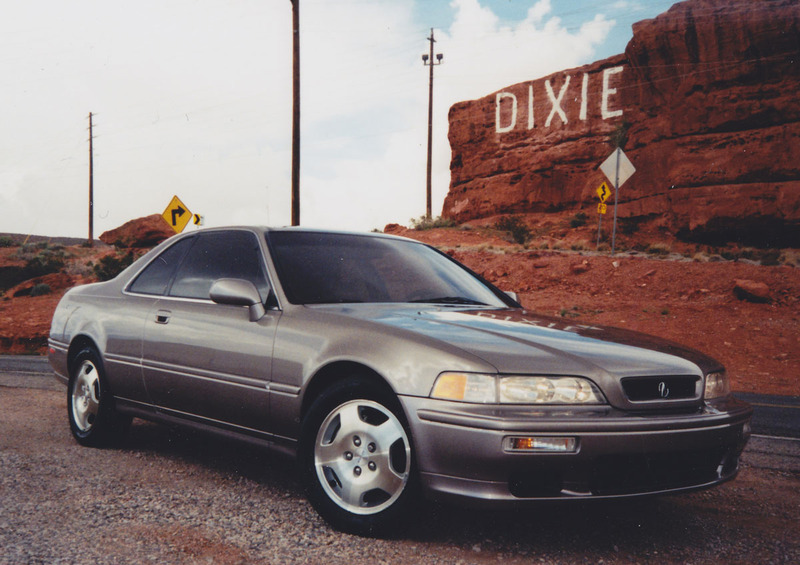 I was still in “honeymoon” phase with my 1994 Legend LS coupe, having picked it up with 95,000 miles on the odometer in March of that year. What else happened in 2003? 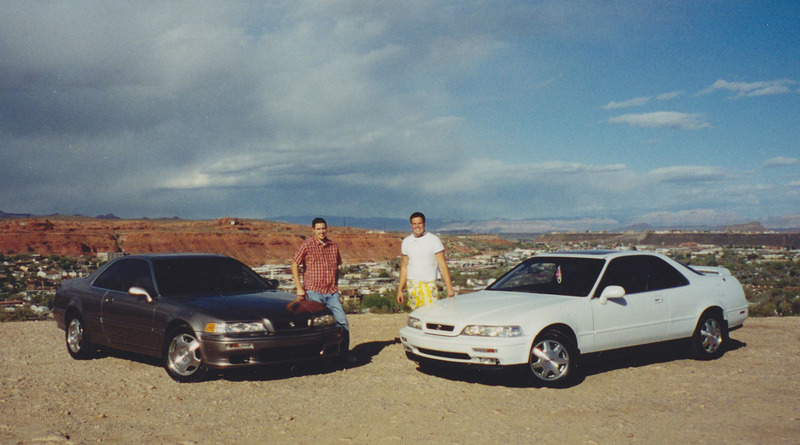 For starters, let’s look at this shot from April 2003 in St. George, Utah. That DIXIE painted on the red sandstone rocks in the background refers to the community’s nickname as “Utah’s Dixie,” having been founded as a cotton-growing farm town by Mormon pioneers in the early 1860s. Around that same time, I landed (pun intended) my first real job — at an airline. SkyWest Airlines is a regional carrier that dates back to 1972 and currently operates as Delta Connection and United Express. I commuted from home to the St. George-based corporate headquarters while attending school part-time for my degree at the local community college. My role at SkyWest was in aircraft records maintenance (imagine that, keeping track of maintenance – doesn’t sound like me at all, right?). I remember how excited I got when I found out there was another employee who drove a Legend coupe. Looks like I still had a thing or two to learn about how to park between the lines. A friend from high school grabbed a Legend coupe of his own. Here, Blair and I are standing next to our Legends at my family’s garage. 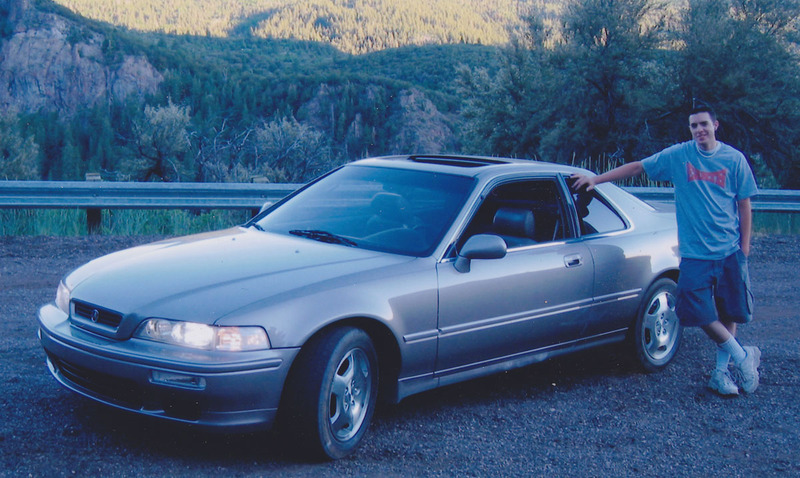 Blair still has his Frost White 1992 LS coupe today. 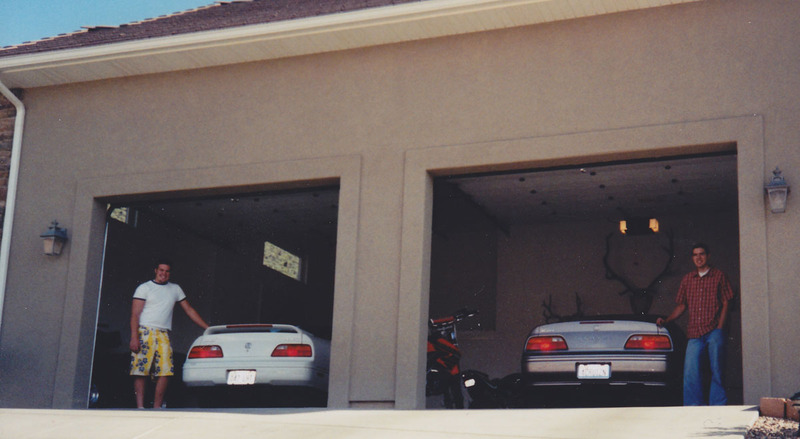 Another view of the garage, this time featuring Grandpa’s Heather Mist Metallic 1997 Acura 3.5 RL. And don’t miss my dad’s antler collection. Blair and I got together frequently for photoshoots and car detailing sessions. Here’s a shot of us taken overlooking the city. In June of that year, I took some off-roading adventures to Beaver Canyon a hundred miles or so north of town. I remember when my brother snapped this picture. My T-shirt was a few sizes too big and I can’t remember the last time I wore athletic socks like that. At least the Legend’s sense of style hasn’t aged as much as mine has. It didn’t take me long until I’d let that “mod bug” bite me. At 21 years old, it was bound to happen. 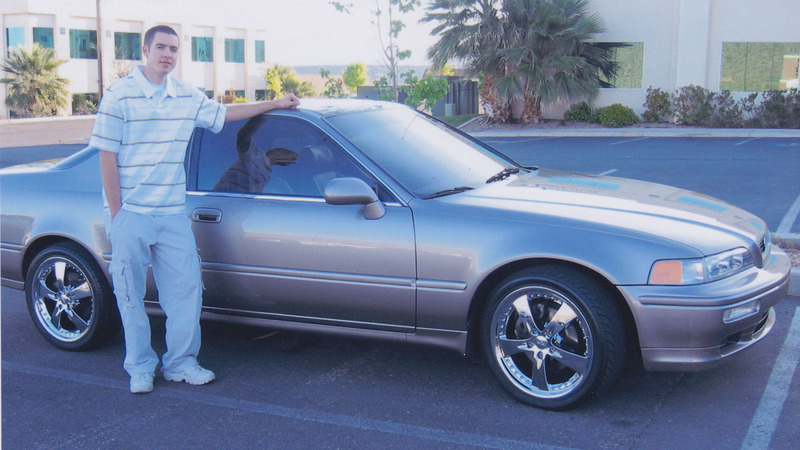 I put a set of 18″ chrome Kaotik Z5 wheels on the coupe (the first of over a dozen sets of wheels and tires I’ve gone through of the years). I must have had a thing for cargo pants & shorts that year. In July, I made a trip to Salt Lake City and met up with my friend Chi. 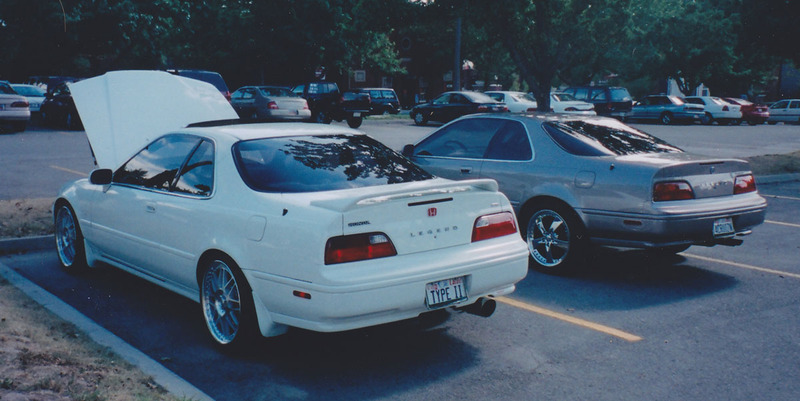 His Taffeta White 1994 Legend LS coupe was fully tricked out. I especially loved his “Type II” license plate. Chi has since sold his Legend. These pictures were taken at a shopping center called Trolley Square. Check out this Acura-only parking I found when I took the NSX to dinner last night. This weekend? Road trip, of course: A quick drop-in at the SEMA Show in Las Vegas, Nevada, and some hiking in southern Utah. See you on the flip side. This entry was posted on November 6, 2014 at 6:37 am and is filed under Legend, Throwback. You can follow any responses to this entry through the RSS 2.0 feed. You can leave a response, or trackback from your own site. 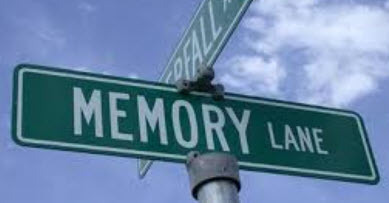 Memory Lane is always a destination of mine. Thanks for the throwback. You betcha! See you tomorrow! hahaha. I’m kinda glad you don’t have those 18″ chrome wheels on the Legend anymore. The OEM wheels suit the Legend really well! Blair’s car is the spitting image of what mine looked like when new, down to all the accessories! Wonder what his production number is. Hey Ben, I found out that Blair’s car is 001382. Is that pretty close to yours in the production sequence? You’re kidding! Yes, VERY close! 12 sets of wheels. WOW. I need a set or two that are different than the OEM 5 spokes. Nah, keep it stock and keep it classy!